Pine nuts are rich in vitamins, polyunsaturated fatty acids, amino acids, minerals and trace elements. Also they are distinguished by the qualitative composition of proteins, fats and carbohydrates. The use of pine nuts is beneficial for all age groups. Nuts can be eaten in different forms like roasted. Before for roasting of pine nuts, they should be thoroughly washed and cleaned from the shell. The best method of cleaning nuts from the shell is handmade using a small wooden hammer. Also to facilitate cleaning, it is recommended to soak the pine nuts in warm water. If you bought nuts in purified form, then you can immediately jump into action. Using a medium temperature, heat a pan without adding oil. The use of oil in this case is redundant, since it is in sufficient quantity is contained in the nuclei of cedar nuts. Cedar oil content of vitamin E is many times higher than in olive, is an excellent antioxidant and enhances immunity. It is worth remembering that a lack of vitamin E leads to the violation of metabolism, which in turn contributes to the emergence of various diseases. Place the nuts in a single layer. In the process of cooking the pine nuts should be stirred up periodically, it is recommended to use a wooden spatula (spoon). It is not necessary to fill in the pan too much nuts, it is better to divide the process into several approaches. Since pine nuts have a high fat content, frying them takes just a few minutes. In any case, do not take your eyes off the pine nuts, otherwise you risk to get instead of useful and tasty treats small embers. If you want to nuts, you can add salt or sugar, any condiments. Valid for any culinary improvisation, only the result came to your taste. Received the roasted nuts can be added to various dishes, they will add unusual taste and aroma. 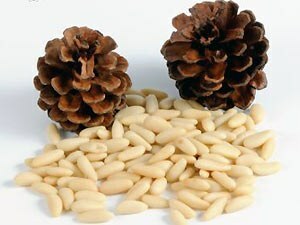 Pine nuts are a great satisfy your hunger. Daily dose use of pine nuts is 20-45 grams.